Are you looking to create a more sustainable and resilient household? Wondering how to retrofit your current home or circumstances? Wanting to grow more food, reduce your energy use and enjoy a more satisfying, fulfilling life? 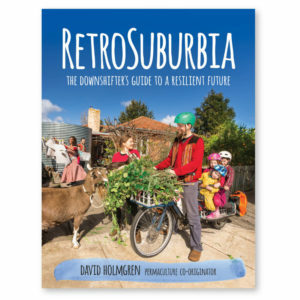 These and other themes from David Holmgren’s new book RetroSuburbia: the downshifter’s guide to a resilient future will be explored in this two-day workshop. Participants will undertake activities and exercises to help them assess their current situation and plan for the future as well as have the opportunity to ask questions and discuss various aspects of the book. Workshop includes morning and afternoon tea. Trainers, educators and community facilitators who would like to incorporate more retrosuburban themes into their practice are invited to attend an extra ‘Trainers and Facilitators’ day at the end of the workshop. Participation in this add-on day allows attendees to become registered retrosuburban trainers with access to extensive training resources, and to apply to have their courses listed on retrosuburbia.com. This day will explore further methods and tools for supporting people to create fulfilling, abundant and sustainable lives through retrofitting their homes, gardens and behaviour patterns. It is also a chance to share your ideas and experiences with other participants working in similar fields, and explore retrosuburban themes in more detail. It is expected that participants on this day will have already read and be familiar with the material in RetroSuburbia. 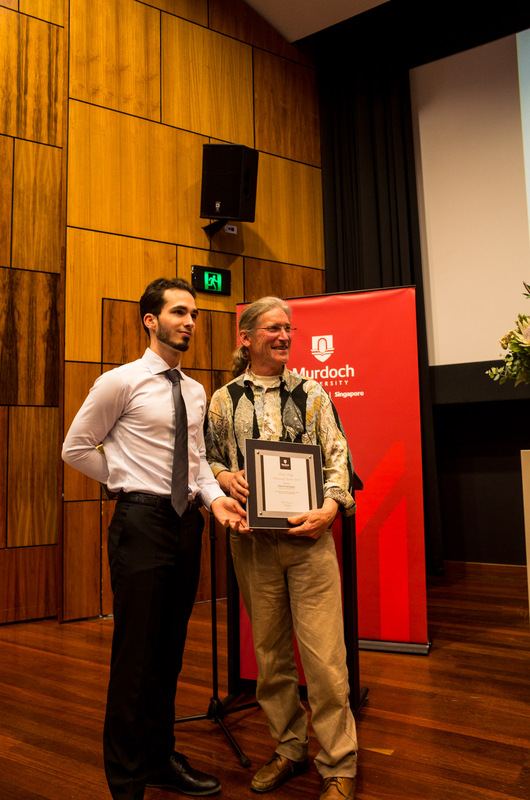 Beck Lowe worked closely with David Holmgren on RetroSuburbia as chief editor, researcher and project manager. Since publication, she has also taken on the role of education coordinator. She is an enthusiastic and experienced permaculture educator and has been involved in permaculture training at all levels for more than 15 years. She has practical permaculture experience in private and community spaces in inner city, urban and rural areas. We can’t wait!! Please join us for this momentous event. RetroSuburbia – four years in the making, is to be launched at the National Sustainable Living Festival in February 2018. Gardening Australia’s Costa Georgiadis will launch the book and will also be in-conversation with David and facilitate a Q&A from the audience. We are hugely lucky that Formidable Vegetable Sound System will be playing tunes on the day. 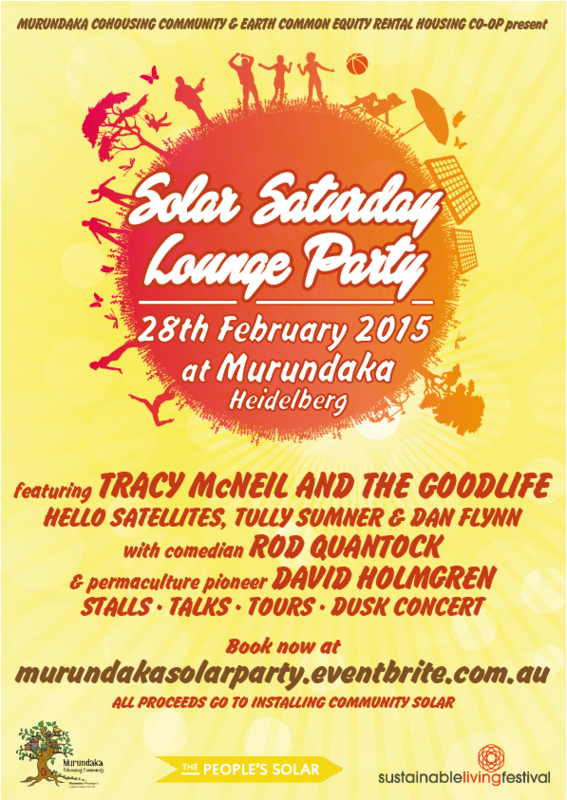 Find out more here: The National Sustainable Living Festival. We have a stack of events planned over the next few months. Have a browse through our Events page to see if there’s anything that takes your fancy. We have listed all the tours for the coming season, which starts next month, so you can visit us here at Melliodora and experience what a 30+ year permaculture property looks like. Places are limited and bookings are essential. There is a local food panel featuring 5 stellar local women including Melliodora’s own Su Dennett. 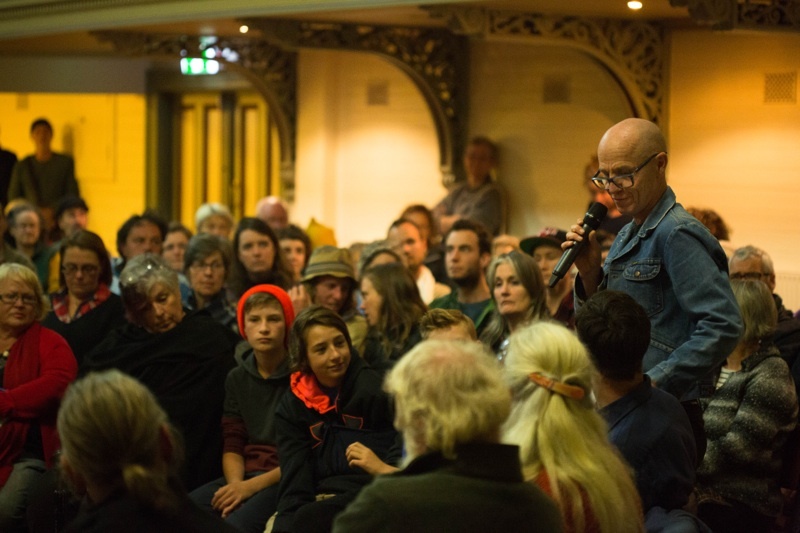 David will be presenting A History from the Future at the Daylesford Words in Winter festival. Also at Words in Winter, the winner of the Venie Holmgren Environmental Poetry Prize will be announced. 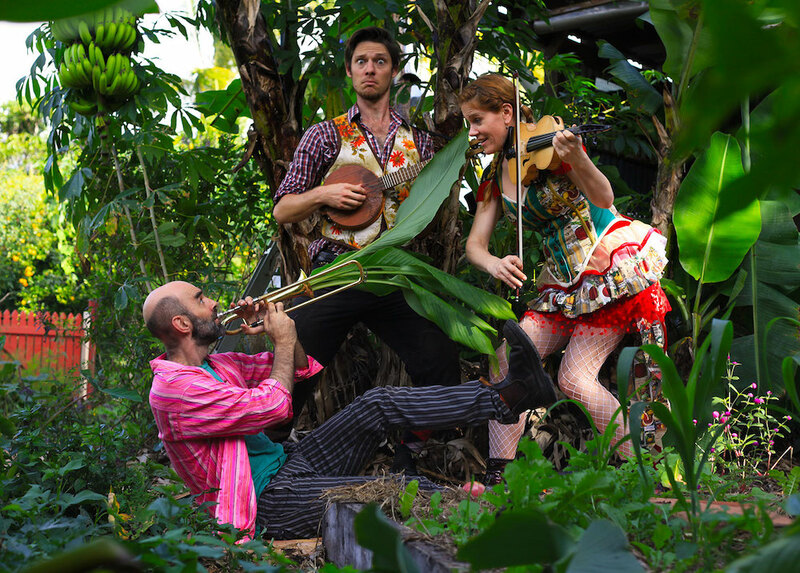 Formidable Vegetable Sound System is coming to Daylesford to launch their forthcoming album, Grow Do It. Yay Charlie!! David will be teaching on various PDC’s including at CERES, at the Food Forest in November, and at the Rocklyn ashram in February 2017 (more details to come). 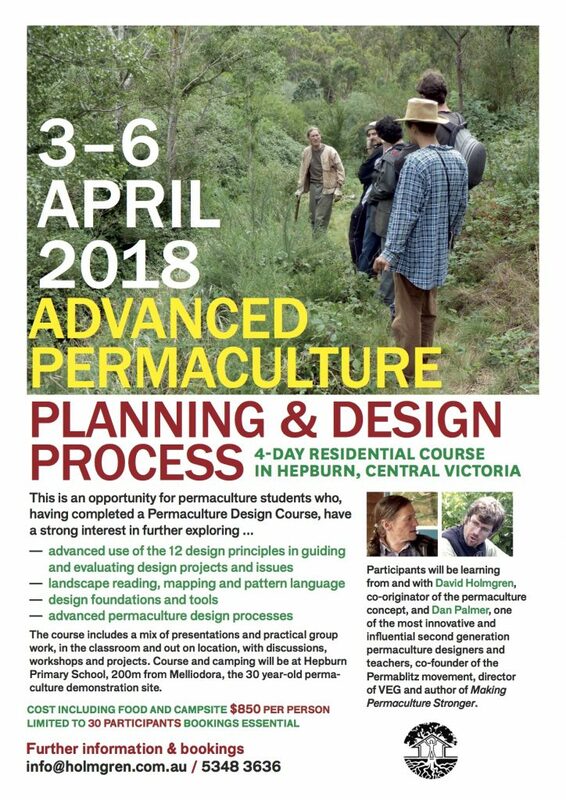 In November, while David is in WA for the Australasian Permaculture Convergence and Permaculture Festival, he will be giving a keynote address and several talks about various aspects of permaculture ranging from future scenarios, permaculture in higher education, revitalising the landscapes and communities that will raise the next generation and his forthcoming book, RetroSuburbia. While in WA, we are pleased to announce that David will also be presenting the Keith Roby Memorial Lecture in Community Science. What an exciting list! This is just a snapshot. Please head on over to our Events page for the full rundown of tours, talks and special events. What does it take to create a local food system that is healthy, affordable and sustainable for Australia? Our local food industry is being neglected while Australia’s national food and agriculture debate focuses on boosting production and increasing exports. Other countries, such as the US and Canada, that have explicitly prioritised local food, are now reaping economic benefits. Local government in Australia has begun to analyse the benefits of a larger local food industry. For example, Mornington Peninsula Shire found in preliminary modelling that expanding its local food industry by 5% would bring in A$15 million and create nearly 200 jobs. The Municipal Association of Victoria two-day conference, The Future of Local Food, will explore how to best design food systems to meet the challenges of the 21st century. Among its varied speakers, the conference will feature David Holmgren, whose presentation, ‘Vision of the Bioregional Food System adapted to Energy Descent Futures’ will highlight the need to consider futures different from Business-As-Usual. 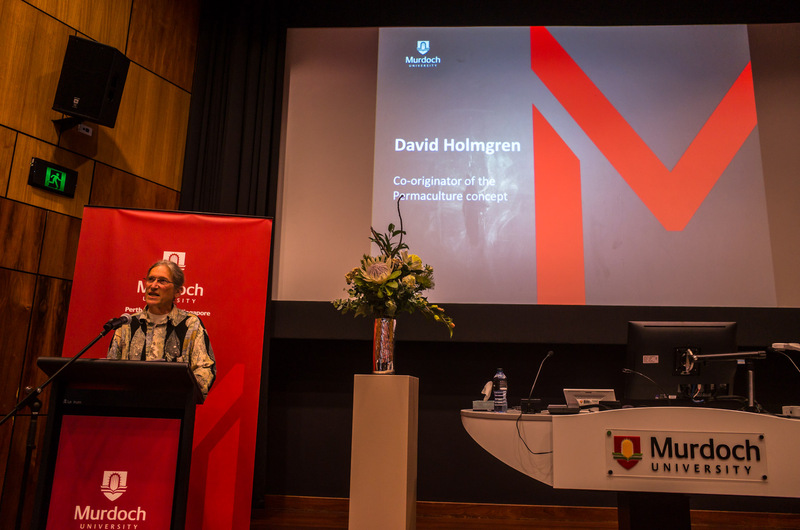 Holmgren will discuss how local government areas (urban and rural) might fit into an emerging bioregional economy if and when the global one declines. 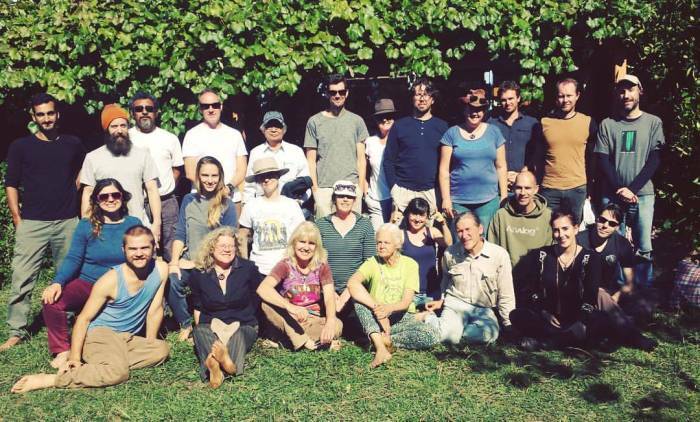 In 2015 a small community formed an emerging ecovillage in Gippsland, Victoria, and challenged themselves to explore a radically simpler way of life based on material sufficiency, frugality, permaculture, alternative technology and local economy. Made by Jordan Osmond and Samuel Alexander, A Simpler Way: Crisis as Opportunity is a documentary that tells the story of this community’s living experiment, in the hope of sparking a broader conversation about the challenges and opportunities of living in an age of limits. The documentary also presents new and exclusive interviews with leading activists and educators in the world’s most promising social movements, including David Holmgren (permaculture), Helena Norberg-Hodge (localisation), Ted Trainer (the simpler way), Nicole Foss (energy and finance), Bill Metcalf (intentional communities) and Graham Turner (limits to growth). Friday, June 3, 2016 from 6:15 PM to 9:30 PM. Victorian Trades Hall Council (New Council Chambers) – 54 Victoria Street, Carlton, VIC 3053. Doors open at 6.15pm, with time to mingle before Samuel Alexander introduces the film at 6.45pm. The screening begins at 7pm. 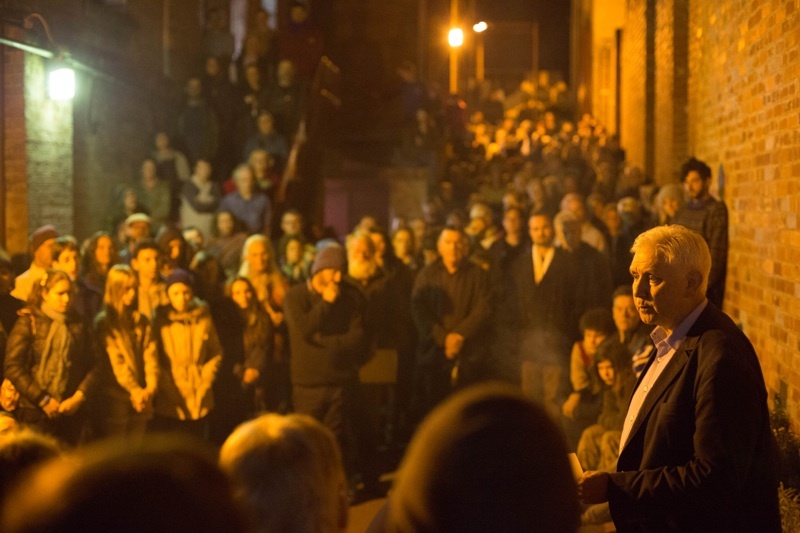 After the film at 8.30pm, the filmmakers will welcome comments and questions about the issues raised, and a panel, including David Holmgren, will also answer questions. The evening will wrap up around 9.30pm. 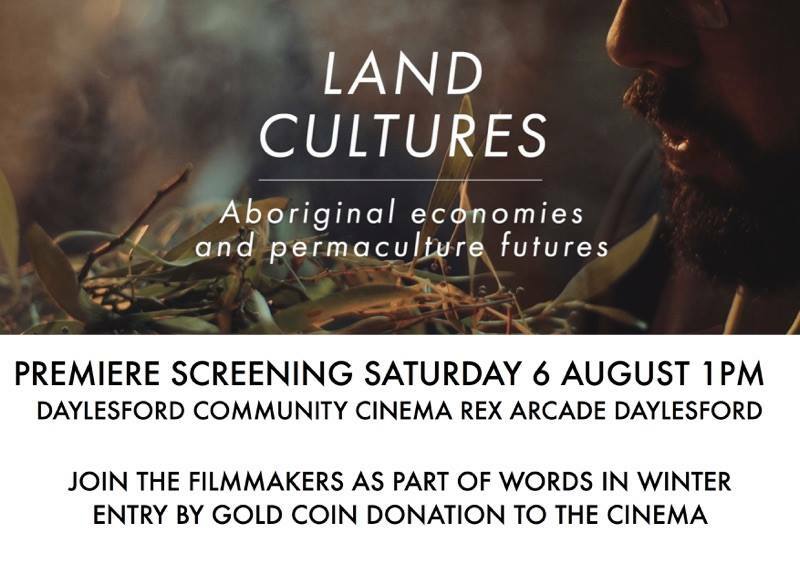 There will be nibbles and drinks prior to the screening. Please bring your own cup/mug to minimise the use of recyclables. You can pre-order tickets here. Well, what a night! Thank you to everyone who came along to Land Cultures to hear Bruce and David tell stories and share knowledges and experiences. 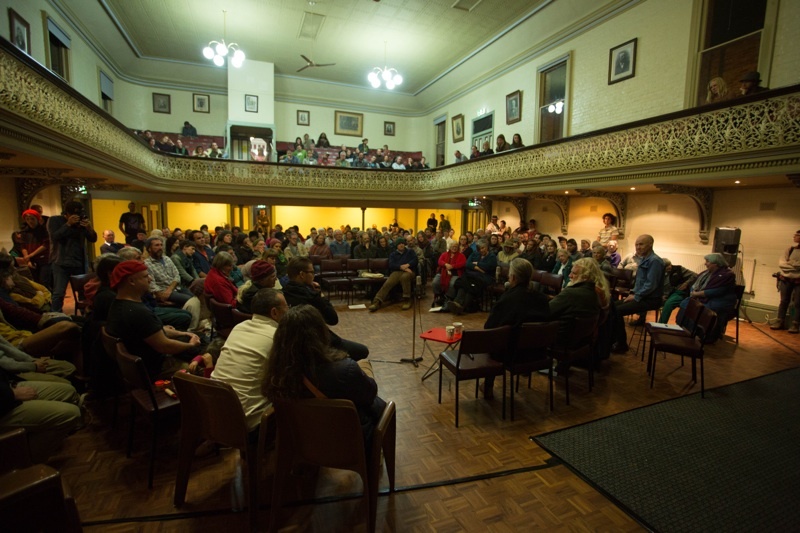 The Daylesford Town Hall was packed with keen punters of all ages. If you weren’t able to make it, we’ll share the podcast and video as soon as they’re available. 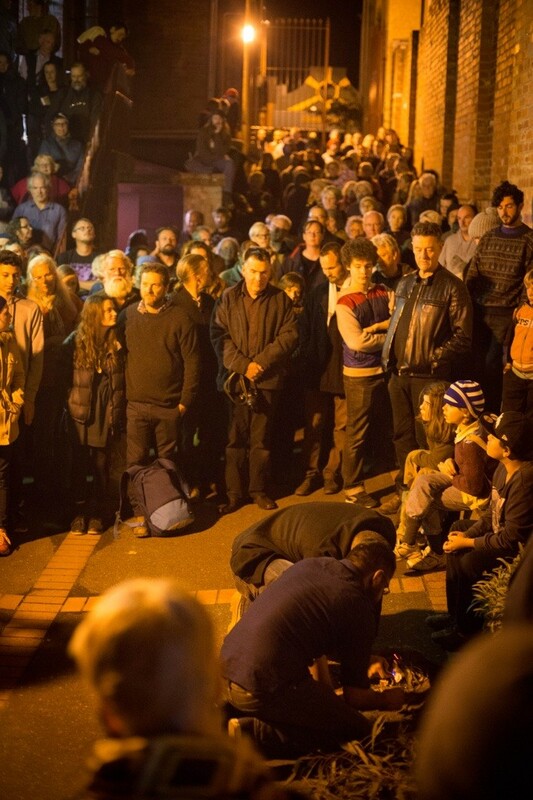 For now, here are a few photos that capture the wonderful spirit of the night. 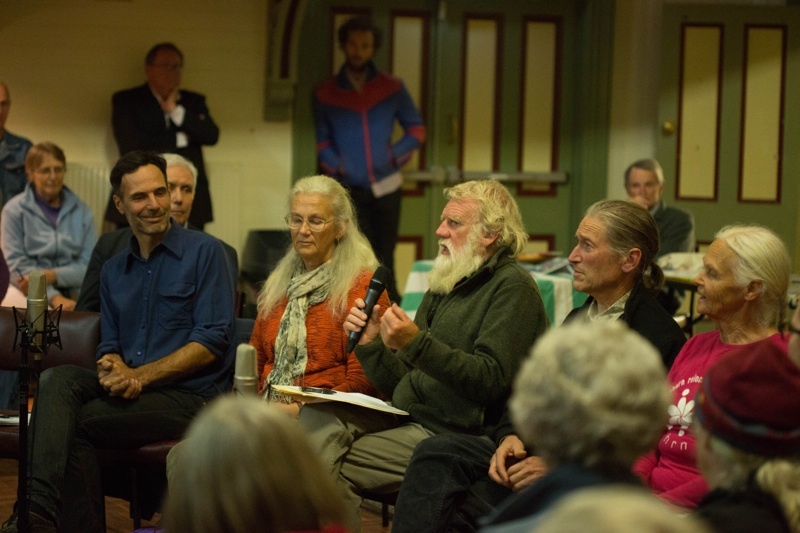 Thank you Oliver Holmgren for the pics and thank you to the Hepburn Relocalisation Network for organising the event with the support of the Hepburn Shire Council. Patrick Jones MCs the proceedings. Over the last 8 years David Holmgren’s Future Scenarios work has provided a framework through which permaculture, transition and kindred activists have better understood, navigated and even taken advantage of the chaotic changes unfolding in our world driven by peaking resources, environmental tipping points, economic contraction and geopolitical instability. His more recent (2013) essay Crash On Demand: Welcome to the Brown Tech Future triggered a global debate in the peak oil blogosphere and more locally (eg Great Debate at the Melbourne Sustainable Living Festival) about local adaption vs grand global plans. In this keynote David Holmgren builds on the lessons of 40 years of permaculture and kindred activism to articulate how the bottom up permaculture strategies that focus at the personal, household, enterprise and community level can be effective where mass movements to demand top down change are repeatedly derailed or simply reinvent the problems in new forms ( the solution becomes the problem). At a time when environmental activists are feeling increasingly embattled and desperate, the opportunities for permaculture have never been greater. Are we ready to use whatever agency remains at the personal, household and community level to turn the problems into solutions? Permaculture is a design system for sustainable land use and living. It articulates and applies the design principles of nature in new ways appropriate to the energy descent era of industrial civilisation. 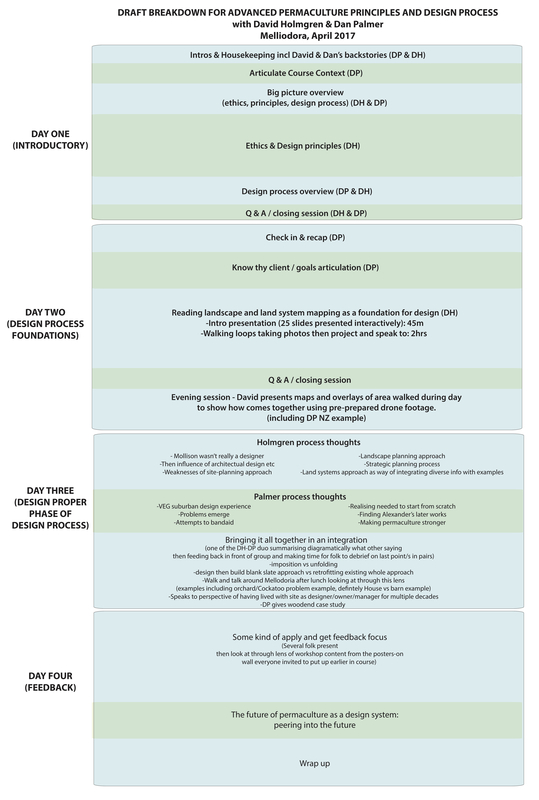 These design principles are embedded in an ethical framework derived from the commonalities of indigenous and traditional cultures of place. Permaculture activism uses global understanding to inform local action at the personal, household and community scale to create models capable of viral proliferation. Permies seeks to create the world we do want by direct constructive action rather than stopping the world we don’t want by restrictive action. Permaculture’s popularity especially with environmentally aware youth over three generations can be partly attributed to a “good cop/bad cop” synergy with more conventional oppositional activism. Thus those who have done their time in direct action in the forest (or shale gas blockades) are often supported by those who spend their positive energy on the permablitz front line. Similarly for more mature people, being the change we want to see in the world is far more empowering, than using all our capacity and credentials to push for policy change from the top down. mass movements threatening revolution to force change at the top. Those committed to these pathways argue theirs is the best. Often the pathway of changing the world by changing ourselves is ignored or denigrated as self obsessed navel gazing. In the permaculture movement the value of this DIY approach is taken for granted but permies often have difficulty in articulating to others why this approach is at least as important as the other three in shaping a more positive future for ourselves, humanity and nature. I want to go one step further to articulate why the DIY and DIO (doing it ourselves) approaches of permaculture are the most efficient, resilient and empowering ways to focus our own limited power in the world. Activism that is good for our bodies and our minds is fun and empowering, and makes us more self reliant, and resilient in the face of uncertain futures, is a much easier sell than activism that involves self sacrifice for some larger collective good. In this sense permaculture shares some common ground with green corporate capitalism’s focus on rewards as a motivation even if the rewards are primarily non monetary. Big solutions to big problems often recreate the problem in a new form. Small scale solutions have the advantage of being site and situation specific and being more amenable to incremental organic adaptation with less risk that failures causes higher order systemic failures. For example local raw milk Community Supported Agriculture system have some real (very low) risk of causing illness but large scale corporate supply systems of industrial milk have created problems where large numbers of people spread across countries become sick before corrective responses can be enacted. In addition there is strong evidence many successful small business get started in the household and community economies of gift, exchange and reciprocity before growing into the monetary economy. In the future, two processes suggest this might be the main mechanism by which we grow a new monetary economy. Credit crunches from deflationary economics eliminate bank finance for small business so the bootstraps DIY approach is the only option. Secondly the capacity of governments to enforce regulatory barriers that currently stymie home producers going commercial, will be unsustainable. and mostly under the radar of the government regulators whose function is to secure the market for bank financed corporate investment. The potential for mass adoption is the test that most political activists want to see before they will accept any value from DIY approaches. Can we persuade everyone to grow their own vegetables? What if everyone had a wood stove? Is there enough land in the city to grow all the food? How will it help us close down a brown coal power station? Mainstream political action focuses on persuading the majority because the majority is always the biggest game in town. This focus on majorities is strategically useless for smaller order players like environmental and social activists. Apart from the need to counter the massive propaganda might of the strongest lobby groups, it ignores an important trend in affluent, notionally democratic nations at least since the thatcherite/reganite revolution of the early 1980’s . A simple or even large majority is not enough to persuade elite power structures to roll over and implement policies that directly threaten their own power (eg Iraq war 2003). Whatever the effects on centralized systems, the experience of building the parallel systems from the bottom up will expose the strengths, weaknesses, opportunities and threats through a rapid learning cycle. In the process we can better articulate a larger scale public policy agenda that would allow the next level of adoption and adaption as well as clarifying the design characteristics necessary for any truly useful larger scale government or corporate driven solutions. The response of the centralized power structures to such a systemic strike might be to introduce draconic regulations and politically demonise those pursuing DIY enlightened self interest. We should expect more of this but there are limits to how effective such responses might be. Firstly the diffuse, even invisible nature of many of these personal and household strategies makes them inherently difficult to control. Recent attempts to control raw milk in Victoria are likely to be as ineffective as drug prohibition – every man and his dog now admits has failed despite massive resources and efforts on the part of the state. Secondly demonizing raw milk consumers and gardeners is somewhat harder than doing the same to so-called radical Islamists. The alternative more hopeful response of centralized power might be to engage in political discourse to encourage the striking minority to come back into the fold. “We need your consumption and your creativity, what would you like to be paid to be part of the Team (Australia)” Being relatively autonomous gives us much more political leverage than being part of a mass movement of completely dependent consumers and indebted workers. In the Brown Tech future that I believe we are increasingly locked into – nationally and globally – I think there will still be some opportunities for constructive dialogue with those trying to bring about top down change either with/through government or corporations; but we should expect that some of these opportunities will almost inevitably turn the solution back into the problem. In the face of unfolding environmental, geological, economic and geopolitical crises, the ability to ‘speak truth to power’ in defense of dispossessed people and voiceless nature will become more symbolic that effective in achieving resilience let alone justice. On the other hand, the urgency in building the parallel systems on the conceptual and geographic fringes (edges and margins principle) will grow and the interest from those wanting to participate with their hands and hearts will increase to a flood. The ability to replicate workable alternatives to the strictures of contracting but monopolistic centralized systems will be a challenge for permaculture activists. At the moment, turning the tide of the majority to our way would be more of a destructive tsunami than a surfable wave. If we can prove to ourselves that we can enjoy life living more healthy and resilient lives, less dependent on centralized systems while massively reducing our ecological footprint in the process, then we provide a pattern than others can copy. At the same time we contribute the diversity of solutions that can model whatever utility and hope remains for system-wide reform and redesign. And if that fails at least we lived the solution and have a multiplicity of lifeboats that give the best chance of saving the useful bits and even the essence of wisdom from a failing civilization for the emergence of the next. Zooming back from the over-the-horizon big picture to the here and now, I would like to suggest ways in which we can make the DIY and DIO strategies achieve their great potential for positive change. DIY suggests a learning process with less than perfect results, but if we want others to copy us then the work of reviewing, debugging and refining our solutions is essential. 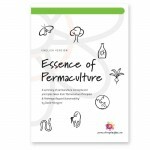 The fact that permaculture has generated a lot of half baked outcomes by people who are “jacks of all trades but masters of none”, is to some extent an inevitable outcome of the experimental and generalist integrated nature of permaculture solutions. However to establish any credibility – let alone have others copy us – requires food gardens that are abundant, compost toilets that smell sweet and lifestyles that are attractive to at least a motivated minority. We don’t need to dumb permaculture down for the masses but it does need to work at least on the terms of those who are interested. Most of all in celebrating our being jacks and jills of all trades, we should aim – at least in maturity – to also become masters and mistresses of one. One trade that can allow us to be truly useful members of relocalising communities where many may not recognize permaculture understandings – let alone p c ideology – as having any value. Energy descent futures, especially of the Brown Tech variation will not necessarily see permaculture as widely appreciated. While this first issue [specify the issue]is about the reality and perception of effective solutions that have the power to spread, the second is about the degree to which apparently practical and effective permaculture designs are leading to substantial decoupling from the globalized economies that are now degrading humanity’s future. In the same way that it is not clear that renewable technologies can proliferate without abundant fossil fuels and debt financing, it is not clear that when we live our permaculture lifestyle we are not just participating in global degradation through more indirect pathways. We need to demonstrate that the DIY and DIO strategies of permaculture are workable, enjoyable and empowering but most of all that they can spread, if not like wildfire, then like a cool burn (or a compost culture) that regenerates the understory of our brittle and flammable communities. February is a great time to be in Melbourne. The weather is warm and the whole city is abuzz with “sustainability” events. Albeit only for a month, it is still warming to see a whole lot of people embracing the concept of sustainability. Naturally the man who once chose the subtitle of his book to read “principles and pathways beyond sustainability” is in demand at such a time. As we reported here earlier David Holmgren is taking the stage with some of the sharpest thinkers and keen doers to discuss whether to collapse or not to on Feb 13. More about the great debate here. 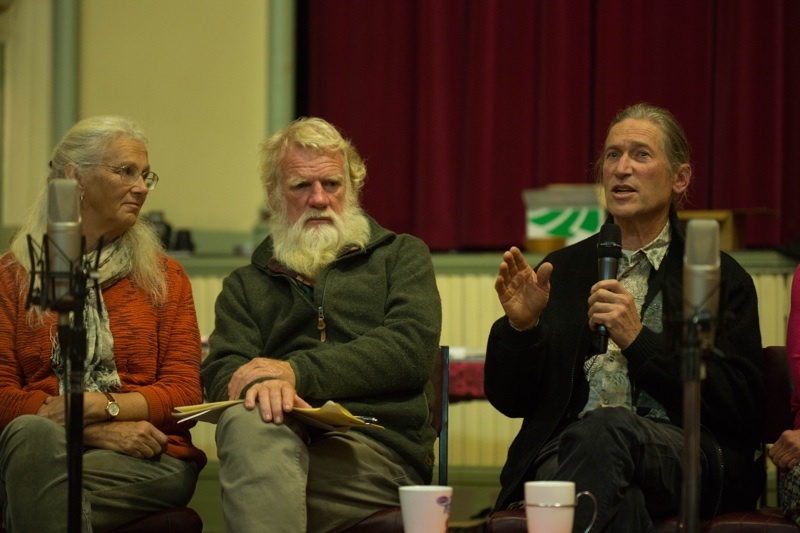 In the following week on Feb 19, he and Su Dennett from Melliodora go to Melbourne to take part in “#EatBuyGrow Rally + Event” organised by Regrarians. Both David and Su will be addressing the rally during the day and the evening event alongside Joel Salatin (‘World’s Most Innovative Farmer’ ), Costa Georgiadis (Gardening Australia), Cyndi O’Meara (Changing habits), Belinda Hagan (2013 Victorian Farmer of the Year), Tammi Jonas (Australian Food Sovereignty Alliance President) and many many others. The day is aims to raise awareness of what producers are going through due to irrational government regulations which seem to want to sever ties with urban consumers. 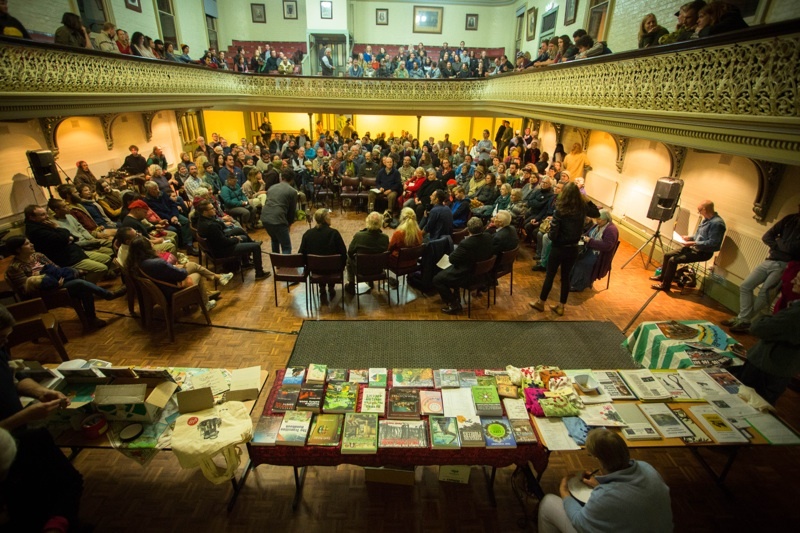 This is the rally bit, but the day is also for celebration of the regenerative food system of producers, chefs and consumers all maintaining vibrant connection with each other. So, why don’t you join us? 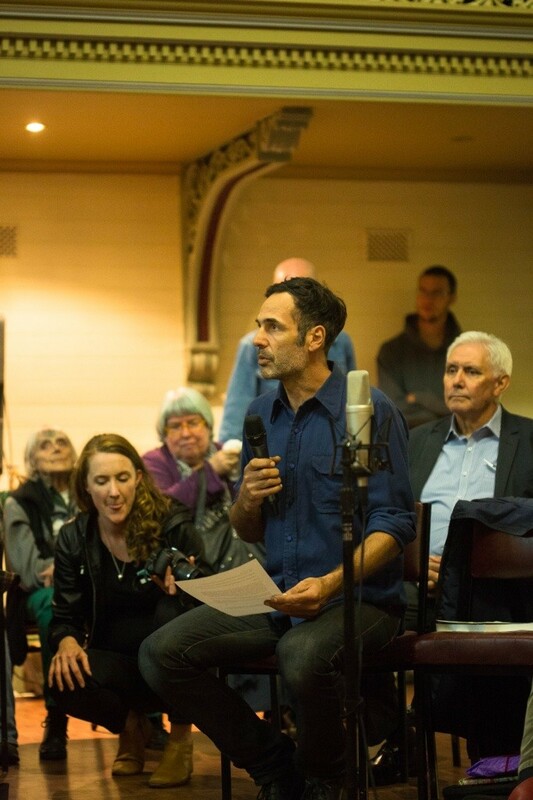 Then on Feb 28th, at the invitation of one of the residents, none other than Greg Foyster, David is going to present “Retrofitting the suburbs” at Murundaka Cohousing Community . 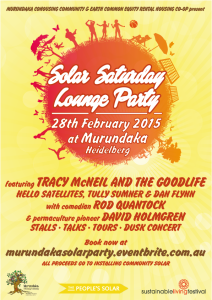 It is a whole day event, Solar Saturday Lounge Party, to raise funds to install solar panels on the community building. 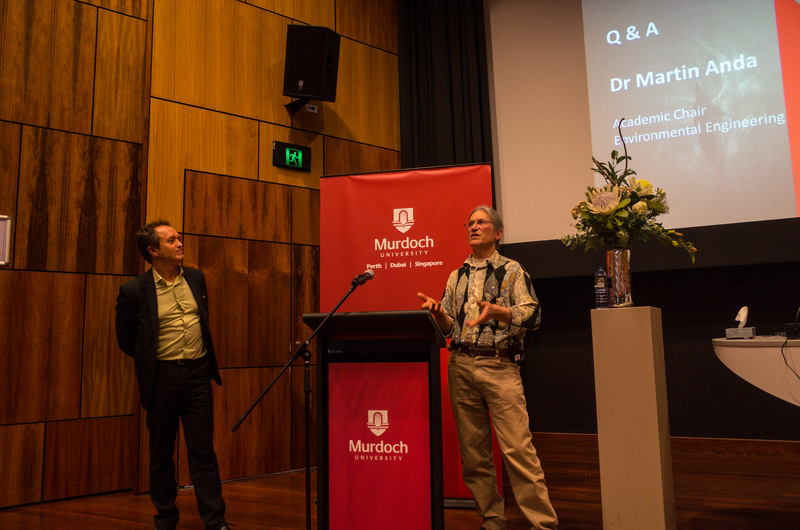 David will take part along with Melliodora’s Su Dennett in the “Hypotheticals” panel discussion chaired by Rod Quantock in the afternoon. Why don’t you come down for a whole great fun filled day at Heidelberg Heights?